Darrell and I launched from Le Roy in Warrior 481 on a beautiful October day in 2012 with a twofold objective. My primary goal was cross-country instrument practice and, indeed, within five hundred feet of breaking ground, I went under the hood to navigate solely by instruments. Groton, a small Connecticut seaside town, was our destination. Several of my friends and former coworkers from Kalamazoo relocated there after UberCo restructurings in 2005 and 2007. Thus, my secondary goal was to take a break from instrument practice to visit with some treasured friends at lunch before returning to Le Roy. In the following weeks, I tried to reschedule, but these attempts were all scuttled by poor weather. After two tries, both of which ended in cancellation, I felt like Lucy convincing Charlie Brown to kick the football, then pulling it away at the last minute. I gave up for 2012 and promised my friends to try again when the weather improved. To my great sorrow, my friend Dave in Groton succumbed to cancer in early 2013 before I could reschedule a visit. Dave brought a keen intellect and kind, gentle manner to everything he did. He is dearly missed by all who knew him. In 2012, I exchanged several messages with him while he was undergoing treatment and hoped to be able to provide support in person. Sometimes, life moves too fast for even an aviator to keep up. 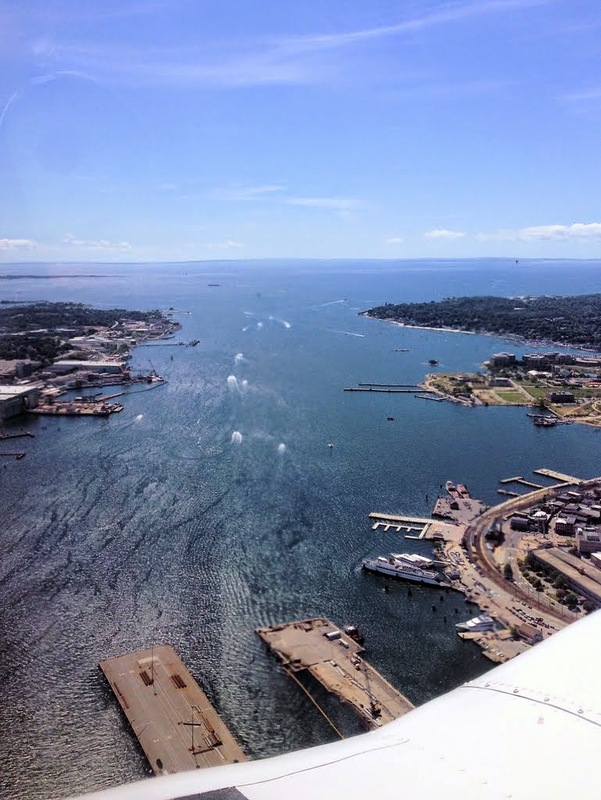 The idea of a return trip to Groton did not lay fallow long. In early 2014, the idea was revived by a geographically diverse trio of friends from Groton, CT; Rochester, NY; and Columbus, OH. I do not know for certain who deserves credit (or blame) for this plan, but it went something like this: Brenda (who reported to me in Kalamazoo, but now lives in Columbus, OH) could drive to Rochester, NY to visit with me and Stacey (another Kalamazoo expatriot and good friend) and, together, the three of us could fly to Groton and visit Leslie (my former supervisor from Kalamazoo). And, of course, there were several others in Groton whom I wanted to see, so it would be a nice reunion of sorts. After all, I had been planning to make the flight anyway, why not bring more folks along? It was a good plan. I was in. Brenda flew right seat while Stacey sat in back and occupied herself with taking pictures on her iPhone (which I tweaked slightly before posting here). Brenda adapted well to her role as copilot. 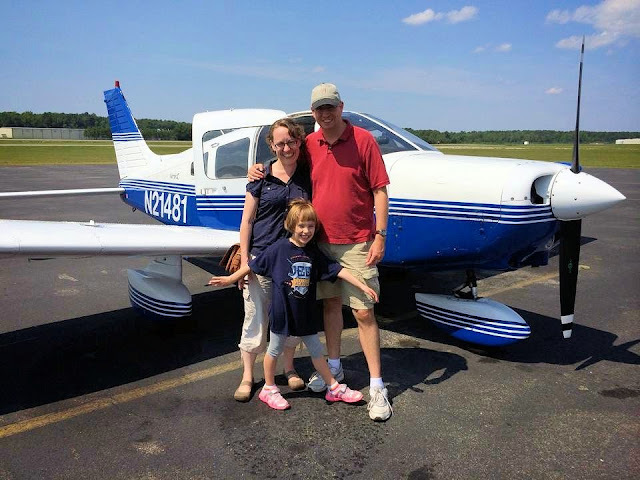 It was not the first ride in Warrior 481 for either of them, but Brenda's last flight was a ten minute hop from South Haven, MI back in 2005 before her kids magically (from my point of view) turned into teenagers. Stacey has flown with me many times. Neither of them have actually undertaken a flying journey by light aircraft before, however. This was new ground. 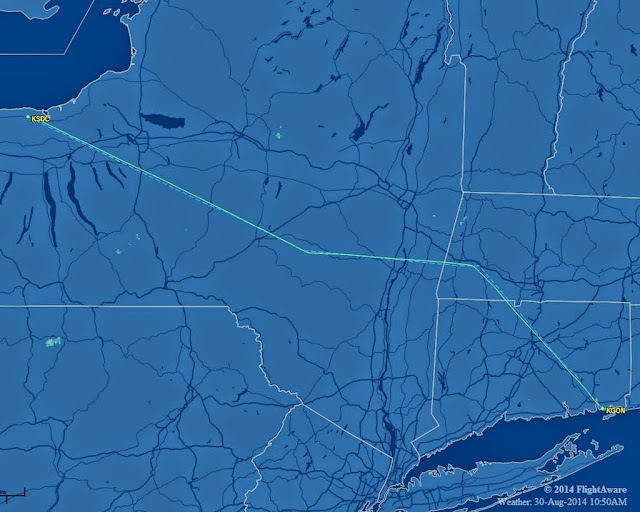 Our direct route to Groton carried us on a southeast heading over the Finger Lakes. 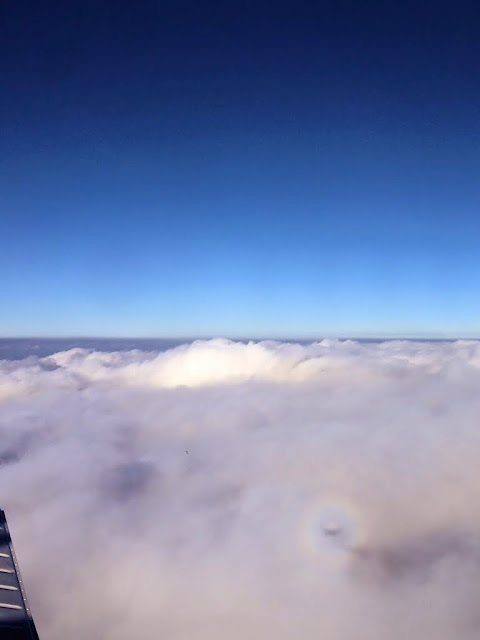 Southeast of Syracuse, we crossed over the top of a cloud deck that remained in place until we reached the ocean. 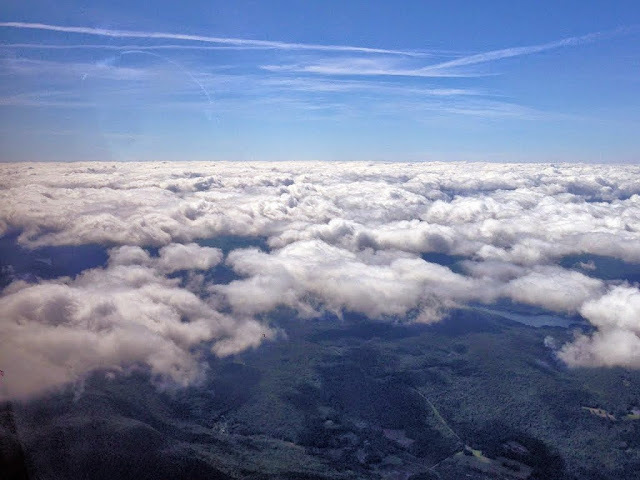 Over the Catskills, there was enough of a break in the undercast to reveal the mountains. We were assigned a new routing that took us east to PONEE intersection, then southeast to Groton. After the complex re-routes I managed around Washington DC two weeks earlier, this made for a trivial change. Bradley Approach descended us from 7,000 feet to 5,000, putting us into the clouds. We popped in and out of them for a few minutes, experiencing some light chop. Neither Brenda nor Stacey are particularly squeamish, but both commented that the view through the windscreen of a white wall approaching at 130 miles per hour was a little disconcerting. Descent to 2500 feet put us just below the cloud bases. 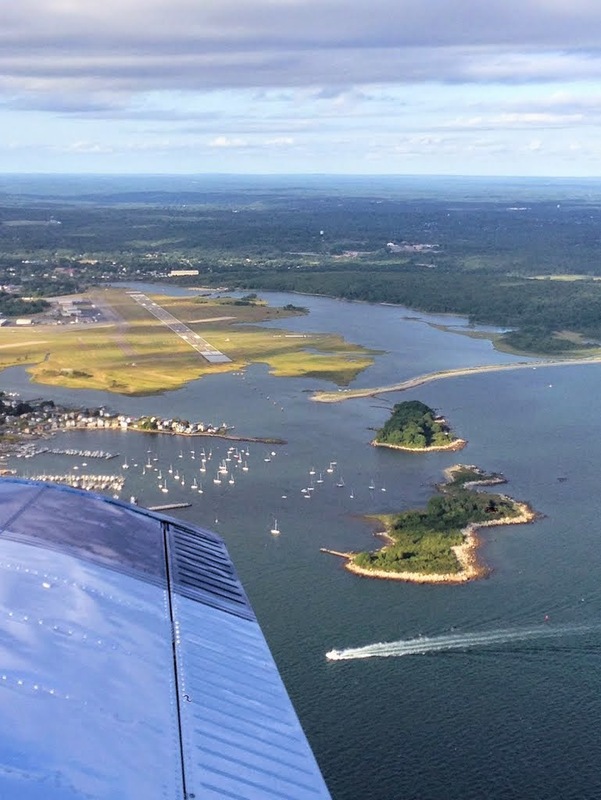 We were already on a heading that lined us up for runway 15 at Groton. Closer to shore, the ceiling dissipated altogether. On final approach, we flew over New London and the Thames River. I rolled the Warrior onto the pavement at Groton in one of the best landings I have made all year. It is always nice when that happens with an audience. The tower controller was quite friendly, providing a progressive taxi to the Mystic Jet Center even though I really did not need it or request it. Amidst the ground crew emerging from the Mystic Jet Center to marshal us to parking was a diminutive figure who, even from a distance, was obviously bursting with energy. The word "firecracker" came readily to mind. "And that would be Leslie," noted Stacey. I first met Leslie in January of 1999 when I had dinner with her before interviewing for the scientist position in Kalamazoo. 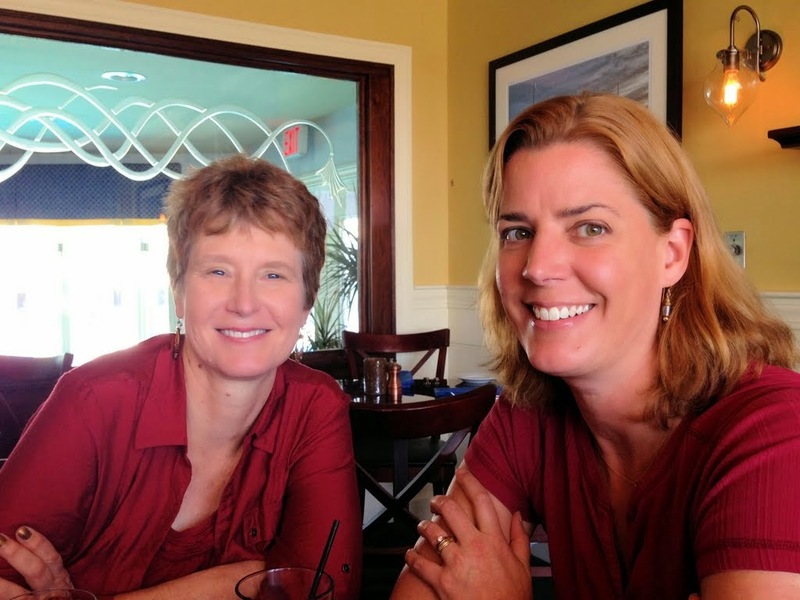 A few years later, she became my direct supervisor and championed my first promotion. She started me down a path that eventually led to my developing a niche expertise for which I later received worldwide recognition. Leslie did a great job of aligning my interests with corporate objectives. I am fortunate to have had many supervisors over the years who were invested in my well being. Leslie ranks highly in that pantheon. The last time was saw each other was in the fall of 2005. Waving enthusiastically, Leslie took pictures while we shut down and I secured the airplane. "This is the coolest thing that has ever happened to me!" Leslie declared, videoing us as we emerged from the Warrior. We received a heroes' welcome in Groton. After a round of hugs were exchanged, the lineman from Mystic commented, "I keep wondering if I should ask you for your autographs." Clearly, Leslie had been talking up our arrival to the FBO staff before we ever landed and they were uniformly amused by her enthusiasm. Lunch was at the Harbour House in Mystic. On the way, we passed Mystic Pizza, the basis for the 1988 Julia Roberts film. The last time I set eyes on it was in January 1999 while making the rounds on interview trips to various places that eventually led me to Kalamazoo, MI. 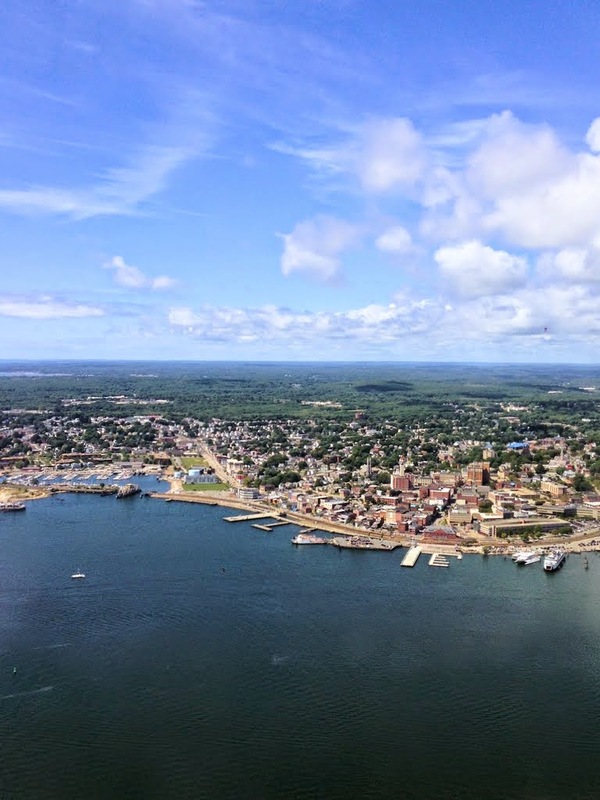 I had declined the opportunity in Groton and, a few years later, declined another. I felt strange being back there. 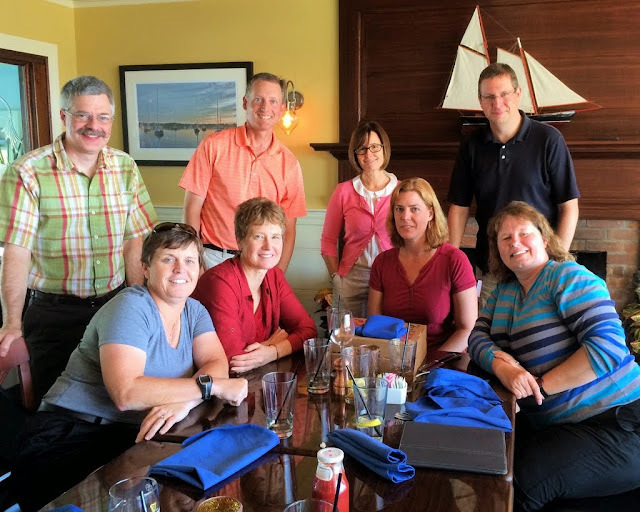 At the Harbour House, we were joined by several others whom I had not seen in years. Standing from left to right are, Brian (who was a group leader at our Ann Arbor campus), Michael (Brenda's supervisor before she joined my lab), Leslie, and me. Seated are Brenda, Dawn (one of two recruiters who interviewed me at Indiana University in the fall of 1998 and recommended me for an on-site visit in Kalamazoo), Janice (who was also in my research group in Kalamazoo and flew with me in August of 2004), and Stacey. Half of the people in this photo have had a significant, positive effect on my career and the other half are just great people. Though we all worked together once, the assembled group is now spread across five different companies. We chatted and reminisced, finally submitting an order to our beleaguered waitress after we had been there nearly an hour. There was a lot of laughing (yeah, we were loud) and good memories brought back to life. "Whenever I came over to Kalamazoo, the Dream Team over here," Brian jerked his thumb at Brenda and I, "used to crack me up." When it came to sarcasm, Brenda and I were always simpatico. Our extended family has experienced a lot of change in the past decade, but everyone is still smiling. After lunch, some of the group went for ice cream. When I pulled out my wallet, Leslie stepped between me and the cashier exclaiming, "oh no, The Pilot will not be buying his own ice cream!" I think this is a great rule to live by and should be written directly into the FARs (Federal Aviation Regulations). After five hours in Connecticut, we said farewell to our friends and boarded the Warrior. The FBO staff allowed Leslie to remain on the ramp, videoing our departure. We were held on the ground for longer than I expected; tower knew that our clearance had been changed from what I filed, but required several minutes to obtain it. We were cleared to depart runway 23, then direct to Barnes (BAF, a VOR in Massachusetts north of Bradley International), then Albany (ALB), then direct Sodus. The coastline was beautiful and I wished that I had taken opportunity to get some pictures, but Stacey covered this well. We passed smoothly through a ceiling at 3,000 feet on our way to an 8,000 foot cruise altitude. Breaking out above the layer, Stacey captured a photograph of a glory without even realizing it. Before reaching Bradley International, we were turned direct to Albany, shortening the route home. We were over clouds until we reached Albany. Though the ride was smooth, we fought a headwind that extended our flight time significantly from the two hours and ten minutes required for the flight to Groton. I preferred to arrive home by sunset, but had done a short night cross country the week before in order to be night current just in case I needed it. From the looks of things, I was going to need it. We were amused to discover that the curious rastering effect that causes spinning propellers to appear as parallel lines on iPhone cameras also applies to propeller shadows as well. Over Albany, our course turned directly into the sun. Brenda and I snugged our hats lower and flew on into the glare like actors in JJ Abram's retooled vision of Star Trek. I was concerned about weather at home. Via Stratus, I monitored thunderstorm activity west of Sodus. Most of the weather appeared to move off to the northeast over Lake Ontario, but the field was reporting gusty winds out of the south; not a great scenario for a night landing on an east/west runway. 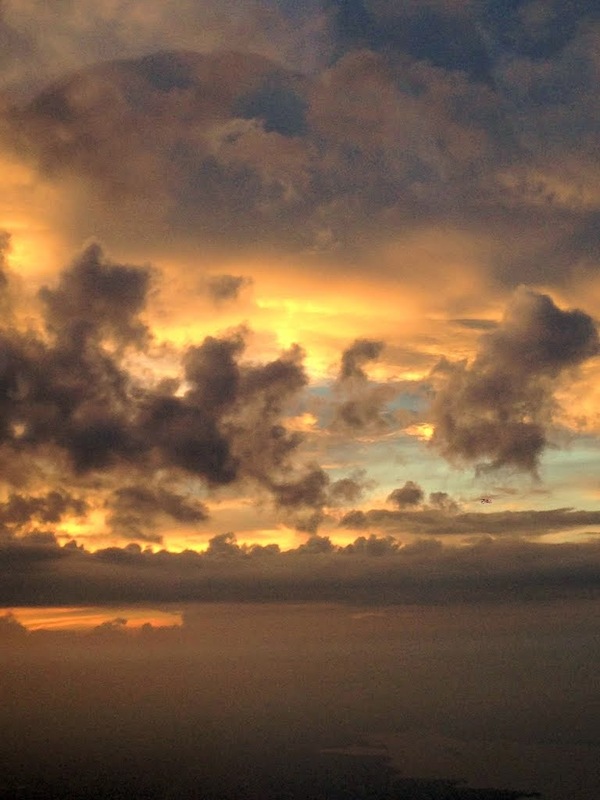 Through her iPhone, Stacey captured the developing sunset. Relief came when the sun dipped behind bands of clouds ahead. 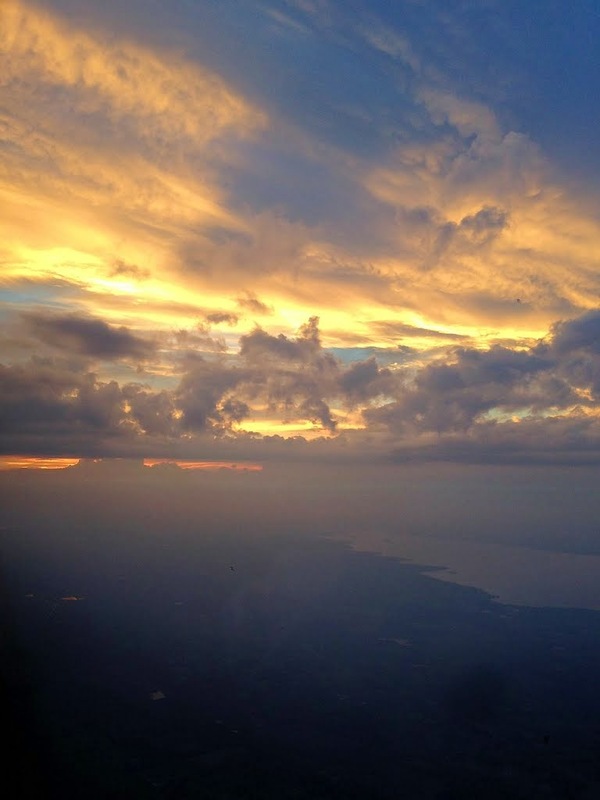 The larger buildups to the right were thunderstorms over Lake Ontario. I was reminded of the scene in Wrath of Khan when the Enterprise engaged in blind "submarine warfare" with Reliant in the Mutara Nebula. Portions of the soundtrack echoed in my mind. Finally, the sun reached the end of its trek across the heavens. 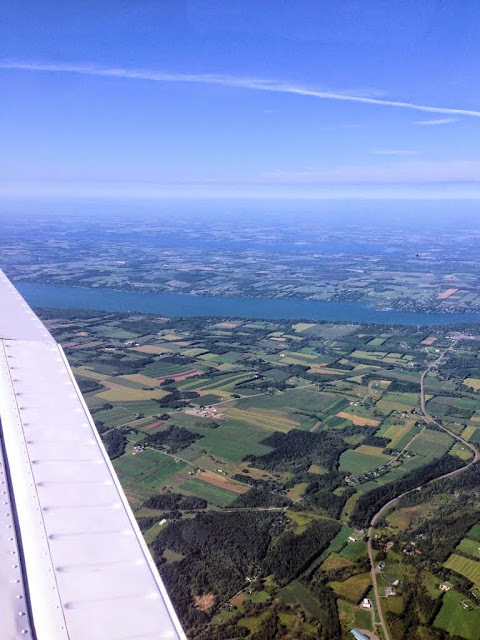 As shadows swelled across the landscape, I visually located the airport beacon and received clearance from Rochester for the visual approach into Sodus. The automated weather system was calling winds out of the south at six knots and I cancelled IFR. I joined the pattern for runway 28, but the winds at pattern altitude were clearly much stronger than six knots. On a left base, the wind pushed us north of the runway before I could turn to final approach. Because the pattern was entirely unpopulated, I chose not to salvage the approach, but simply to transition into a left downwind pattern leg for runway 10 north of the airport. This way, turning left base put us heading south into the wind and slowed our groundspeed. I needed significant correction for wind on final approach and gusts rocked the Warrior as we reached treetop level. We alighted firmly on the upwind wheel. The trees around us were swaying significantly, their upper branches describing massive arcs through the nighttime sky. 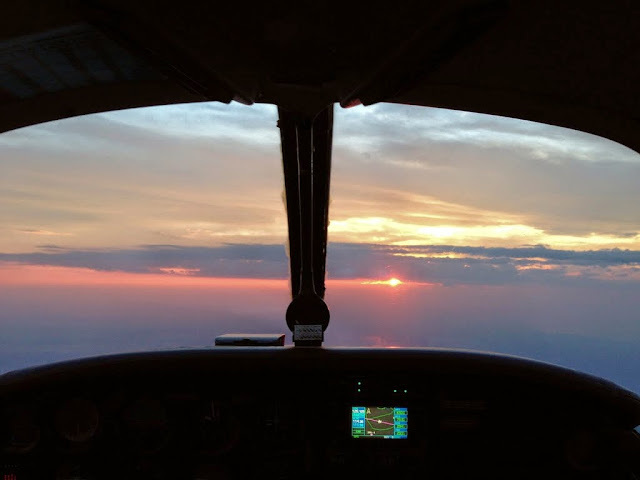 We put the airplane away and headed toward home, where I learned that the rules about The Pilot not needing to buy his ice cream apply to late dinners, too. As I have commented before, flying the airplane is not merely a recreational outlet and intellectual challenge. It's a bridge and a wonderful way to maintain relationships. As Kristy points out, not many people besides herself and The Bear have experienced a cross country flight in the Warrior (exceptions include Joe, Kent and Dan, the latter having flown with me to Reading, PA and Pontiac, MI). 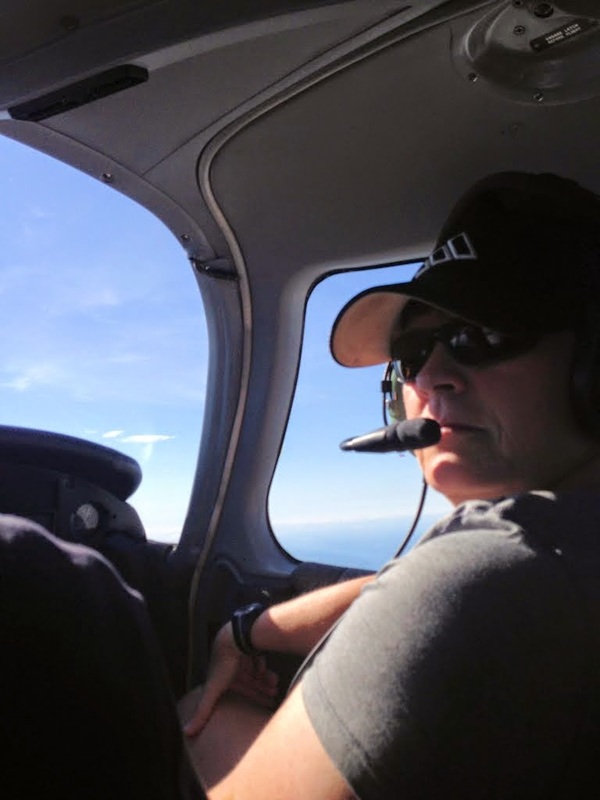 On this trip, Brenda and Stacey got the full general aviation experience: uncontrolled and towered fields; flight under, through, and above the clouds; easy and crosswind landings; day and nighttime flight - practically the full gamut (all that was missing was an instrument approach and a landing on grass). Both were still smiling when it was all done, so that's a good sign. That, or they were still amused by Leslie. 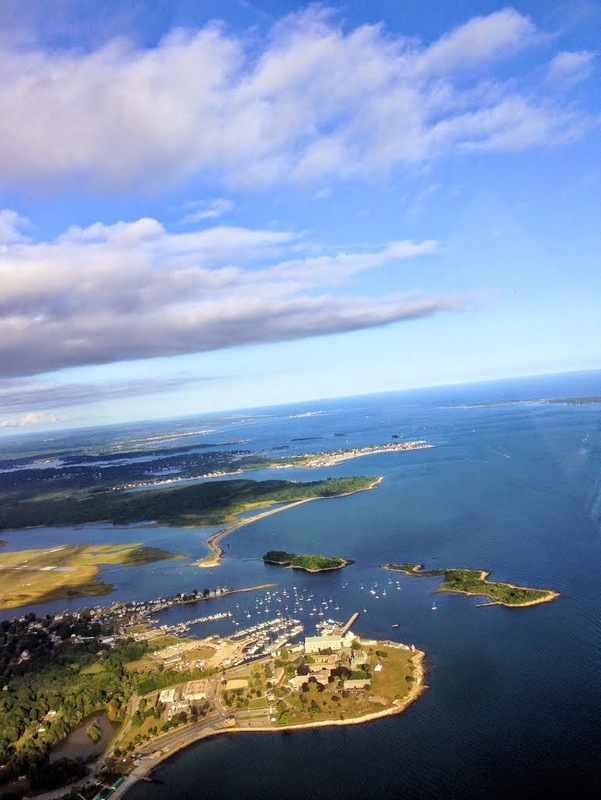 My only regret is that it took me twenty-two months to complete a 2.5 hour flight to Groton. As wonderful a bridge as the airplane can be, it was not enough enable a visit with Dave one last time. After a long summer, time for our auspicious "second annual" summer retreat with Kristy's family had arrived. Two points may define a line, but not always a reliable trend. Still, a successfully planned second gathering goes a long way toward establishing a bona fide tradition. My personal goals for the trip included (1) not thinking about work, (2) relaxing with a good book or two, (3) not thinking about work, (4) playing with The Bear, and (5) not thinking about work. From our various corners of the nation, we converged on Ocean Isle Beach, NC. Kristy and I did not know much about the region prior to our visit. We were to learn that August in this part of the country is beyond hot and that the region is home to palmetto bugs, sort of a southern gentleman's name for cockroaches; big ones that emerge at night to graze the concrete prairie surrounding the swimming pool. Three airports were available for our use. The modest Odell Williamson Municipal Airport in Ocean Isle Beach itself; Grand Strand Airport in nearby North Myrtle Beach, SC; and Cape Fear Regional Jetport / Howie Franklin Field in Oak Island, NC. Somehow, it struck me as strange to fly from Williamson to Williamson. In truth, Odell Williamson would have been the best choice when I was VFR only. 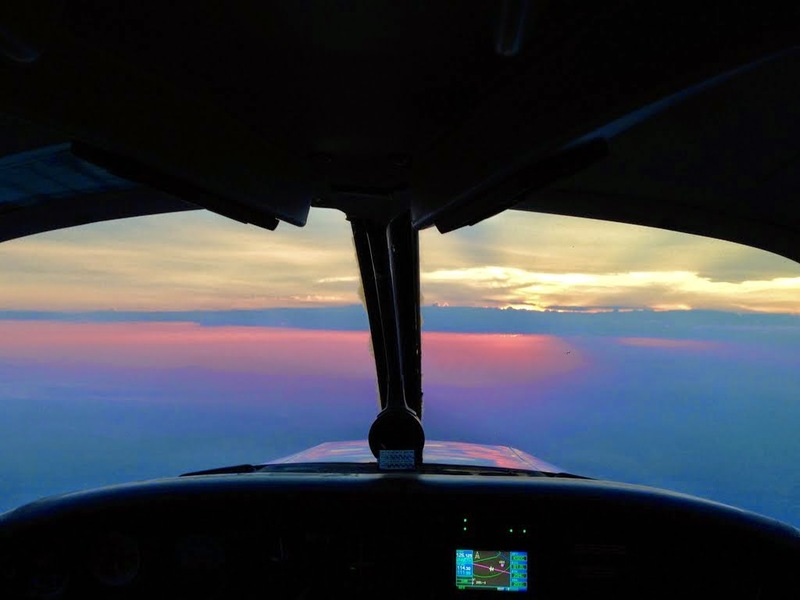 However, it has no instrument approaches available, which would place limitations on arrival and departure conditions (maintaining the rule of thumb that one should not depart an airport in weather conditions that do not permit a return). The other two airports, more or less equidistant to the south and north, were more capable in terms of approaches, providing more flexibility. Of the two, Cape Fear Regional Jetport had the lowest parking fees, so it won. The airport manager, Howie Franklin, is best known as the chief steward on Air Force One from 1976 to 1994 under five different presidents. For the trip south, I planned to break the anticipated six hour flight into three legs. We would stop at Hagerstown, MD for fuel ($5.70 at the Rider Jet Center's self serve pump) and Dinwiddie County Airport in Petersburg, VA to meet Jeff and his family for lunch. 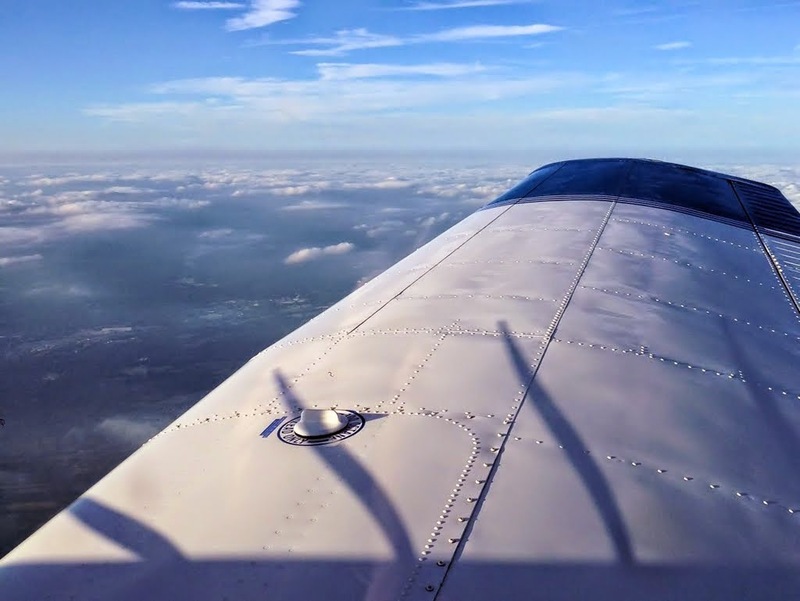 Though I have known Jeff for over ten years, since my earliest days on the Piper Owner Society forums trying to glean tribal knowledge about the airplane I had purchased, we have never met in person. From there, it would be a straight shot to Cape Fear Regional Jetport. I filed, and was cleared, for a direct route from Williamson-Sodus to Hagerstown. With Kristy, The Bear, and our sixty pound suitcase loaded aboard the Warrior, we were en route at 8:00 am. Monitoring 121.5 (the emergency frequency) en route, we heard an airliner inadvertantly broadcast that they had a couple of "specials" and would need two wheelchairs upon their arrival. Clearly, they were on the wrong frequency and meant to be communicating with their own ground staff. "Are the two specials sitting up front?" queried a gruff voice. There was no response from the airliner. Over the southern tier of New York State and proceeding into Pennsylvania, seas of mist pooled around the bases of higher terrain. Closer to Hagerstown, our clearance was amended to direct SCAPE intersection, then direct Hagerstown. We arrived to find an active field with significant traffic inbound for an EAA fly-in that morning. We taxied directly to Rider Jet Center's self-service pump and refueled. This pump has the best fuel hose rewinding reel I have ever seen. Though it may seem a silly thing to remark upon, I was truly impressed. It is a wheel of large diameter and only as wide as the hose itself, resembling a giant film reel. Like a film reel, the hose rewound neatly without the chaotic jumble that usually ensues when using typical fuel pumps. I was so taken with the well-engineered machine that I regret not having the presence of mind to photograph it. Wondrous device. For any airport, it was a quick turn fuel stop. The fact that we had such a "no muss, no fuss" experience at a towered airport was terrific. As we taxied away from the fuel pump, we could hear another aircraft approaching from behind, powered by an old radial judging by the way it snorted and snarled. Sure enough, it was a Stinson Reliant. We received our IFR clearance from the tower and taxied to the departure end of runway 27. We were delayed somewhat because the tower controller had his hands full with another pilot departing the EAA gathering who was clearly unaccustomed to processing "tower-speak". Tower issued a taxi clearance that would require at least two runway crossings and use of a small handful of taxiways. The pilot was simply not processing this information. After several exchanges, the tower controller said, "ok, let's make this easy. Turn left and proceed to the end of runway 9 for departure." It would be a downwind departure, but on a rather long runway and the wind was light. Clearly, the controller deemed this to be safer than trying to direct the fellow to the other side of the airport where we were waiting for IFR release at runway 27. We received our take off clearance and were handed off to Potomac Approach before reaching pattern altitude. Filled with baggage, fuel, and people, Warrior 481 climbed about as enthusiastically as I take the stairs after gorging myself on Thanksgiving dinner. It was clearly inadequate for Potomac Approach, who assigned a "climb vector" before clearing us direct to the Linden VOR. On approach into Dinwiddie County Airport in Petersburg, VA, I was made anxious by the skydiving operation ongoing there. I do not regularly operate around any airports with parachute activity and am not entirely comfortable with applying see-and-avoid practices to bodies dangling under canopies. Nonetheless, I spotted the orange dot of the final canopy drop toward the field while still some distance out. As we taxied onto the ramp, I paused to contemplate parking. The radio crackled. "Chris, you can go ahead and park next to that Citation." I am not accustomed to being addressed by name upon arrival to a new airport, but could see the UNICOM operator talking on a handheld radio and standing next to Jeff and his family. "Daddy," commented The Bear before I powered down the airplane, "the D-word on that building is funny." Dinwiddie County Airport was originally built as a stopover point for World War II aircraft ferried from east coast factories to the Pacfic. From above, the facility obviously once possessed the classic triangular runway configuration typical of WWII era military fields, but at least one of the runways was almost completely erased from the Earth and another was significantly reduced in size. Still, the people were friendly, the fuel was reasonably priced for the area, and the terminal building was very nice. My biggest challenge with Dinwiddie was pronouncing it on the radio in such a way that it did not come out "dimwitty" (and if it ever did, I offer that it was purely by accident). We had a wonderful lunch with Jeff and his family. The Bear took to his kids right away, Jeff and I have more in common than I originally realized (including some mutual friends and some past geographies - evidently all roads lead to, or perhaps from, Kalamazoo), and, as "airplane wives", Kristy and Lori seemed to be cut from a very similar cloth. There was an easy rapport with some nice people and kindred spirits. Back in the sky, we broke one of my cardinal rules for flying south in the summer by departing at 3:00 pm for a two hour flight. Convective activity was under way, but fortunately, it was not widespread. Still, it was a delight to legally flirt with edges of the buildups. Most new instrument pilots are very excited to go barreling through clouds once they earn their ratings. Most also learn very quickly that such behavior can lead to some very rough rides in building cumulus; I know that I did. Where the clouds were obviously building with vigor, we made minor deviations to slalom around them. It is probably the closest I will ever come to flying one of those Red Bull race courses and it was a lot of fun. In some cases, deviations were completely unnecessary and the clouds just seemed to part around the invisible line defining our trajectory. Stratus revealed a smallish thunderstorm to the left of our course, meriting a slight deviation west to avoid it. This was approved by Seymore Johnson Approach. As we passed the beastie, the world beneath it was lost in shadow and mist. Though some weather existed in the vicinity of Cape Fear Regional Jetport, the field was VFR when we arrived. Continuing a theme for the day, the field was actively hosting skydiving operations. 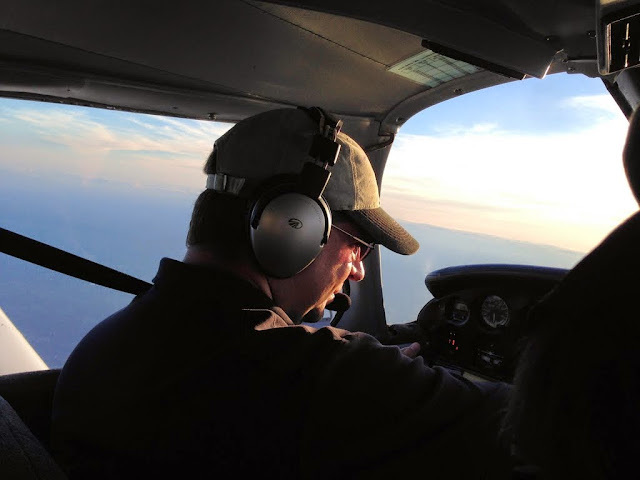 Once certain that all the jumpers were on the ground, we circled southeast of the airport and over the Atlantic coast before entering the pattern. While I looked around to clear the area, I noticed that The Bear was watching the world go by with rapt fascination. FlightAware radar track from PTB to SUT. I do not know why some data are missing, but our deviation around the small cell is clearly depicted. A lineman at Cape Fear Regional directed us to parking, assisted with tying the airplane down, and even lugged that heavy sixty pound suitcase to a golf cart for transport to Kristy's parents' car. Then he vanished before I could tip him. As we left Cape Fear Regional for the week, I made a mental note to check the belly of the airplane for Robert DeNiro (or Sideshow Bob) before departing. 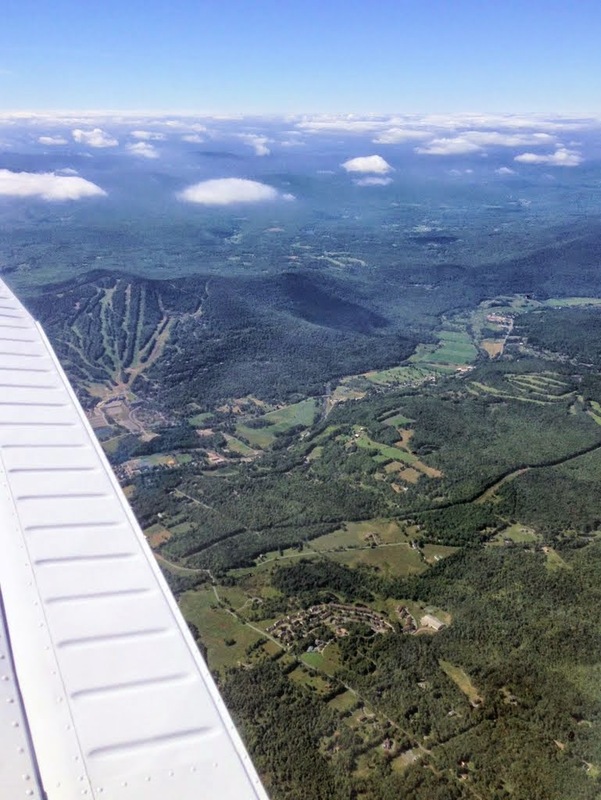 I spent portions of our vacation time planning the return trip, which included a huge ForeFlight update that sucked significant household bandwidth one evening. Forecasts showed that a low pressure system would be sitting on Rochester, NY for a few days, suggesting unsettled weather at home. Nonetheless, forecasts did not indicate any significant weather systems beyond isolated thunderstorms. I planned to fly to Williamsburg, VA with a landing at the Williamsburg-Jamestown Airport for fuel and food at Charly's. From there, we would fly north through the Washington DC SFRA and on to home. We drove through patchy fog en route to the airport, but found conditions to be solidly VFR on our arrival. The Warrior had endured a couple of storms during her time on the ramp at Cape Fear Regional, but there was no water in the cabin and no obvious new hail dents. Though it was only 9:00 am, we sweltered on the surface of the airport. Lining Warrior 481 up on the runway, I could feel a river of sweat flowing between my shoulder blades. I gave the airplane full throttle and she lethargically trudged forward along the runway until reaching flying speed in the high density altitude. From ForeFlight, I expected an airway route from Cape Fear to Williamsburg, but Wilmington Approach cleared us direct. En route, we listened to the drama playing out with Six Six Delta. Our controller was a trainee, but her trainer had to step in several times to deal with Six Six Delta. The aircraft departed Manteo in the Outer Banks and was attempting to receive an IFR clearance from Washington Center in the air. 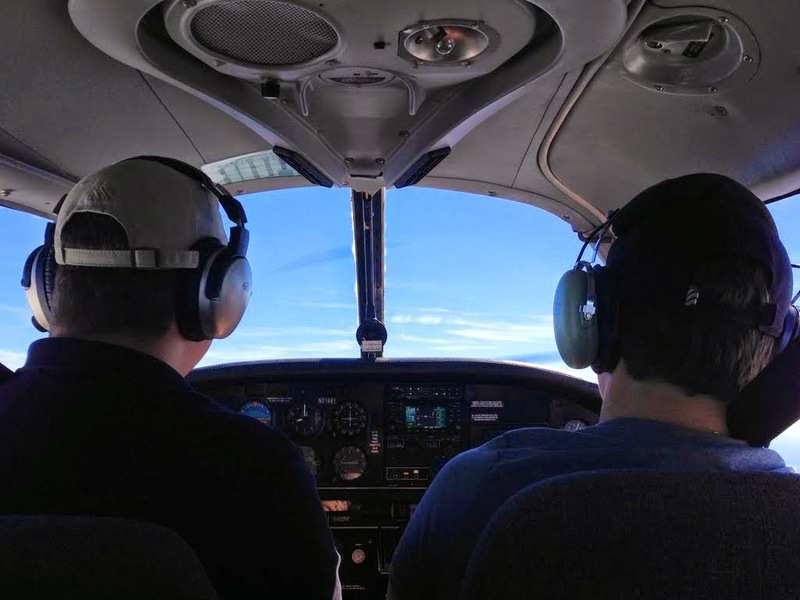 A low ceiling prevented him from climbing to the minimum vectoring altitude and the trainer, who could not see the aircraft on radar, refused to issue a clearance. When Six Six Delta complained, the controller noted that, "perhaps you should not have departed that airport VFR." Something told me that the errant pilot would be receiving a phone number to call at some point, but we were switched to a new sector and did not hear how Six Six Delta's adventure ended. On approach into Williamsburg-Jamestown Airport, Norfolk ("Nawf'k") Approach called to give us a new approach frequency. Upon switching, a new controller immediately instructed us to contact a different frequency. On that frequency, we were immediately given yet another frequency. Making that change, we were issued yet a third frequency. I half expected the crazy radio round robin to end back with our original controller, but we finally landed on a suitable frequency and proceeded inbound to Williamsburg. Joining the right hand traffic pattern for runway 13, it became very obvious to me that I was tired. I misjudged the downwind to base turn, finding myself too close and too high to land. I eased the Warrior into a slip, realized that this tactic was futile, went around, and did a much better job of it the second time. In her photos, The Bear seems to be trying to recapture the magic from Watertown, NY. I chose Williamsburg-Jamestown Airport because reviews claimed that Charly's restaurant was small but excellent. It was. We arrived a little early for the lunch crowd and were seated right away, but the small restaurant soon filled with patrons. Our food was good, priced appropriately, and served with mellow hospitality by our harried waiter. The Bear particularly enjoyed the little playground located adjacent to the terminal building. I let ForeFlight suggest an airway route from Williamsburg back to Sodus. It was: HCM V33 OTT PALEO BAL EMI HAR V31 BEEPS. I filed this while waiting for lunch to arrive and soon received an email verifying it as the expected clearance. As The Bear played on the playground equipment, I sat in the Warrior and dialed my expected route into the Garmin. The airways (V33 and V31) present the most problems because the GNS-430W does not recognize them, meaning that I needed to define them by fixes describing their meandering courses through the sky. V31, for example, zig zags over central Pennsylvania and New York as defined by the Harrisburg, Selinsgrove, Williamsport, and Elmira VORs. It was an exercise in serious knob turning for a few minutes. As we prepared to depart, a Coast Guard helicopter settled on the ramp. This really excited The Bear. After all her time spent flying in light airplanes, I think she's destined to be a helicopter pilot. Helicopters always grab her attention in ways that airplanes - while still interesting to her - do not. Because I have never used one, I tried using the field GCO (ground communications outlet) to get my clearance from Norfolk. Keying the microphone the requisite number of times did not produce anything useful and I opted to pick up the clearance while airborne. Norfolk cleared us as filed and we gratefully clawed our way up to cooler altitudes. When Norfolk handed us off to Potomac Approach, we heard, "Warrior 481, I have a new route for you. Advise when ready to copy." So much for "cleared as filed". I sensed some more knob turning in my immediate future. The new clearance was: direct COLIN PXT V93 BAL, then as filed (i.e., the route would still end with EMI HAR V31 BEEPS). Still climbing, I deleted the obsolete waypoints from the GPS, referred to the chart to obtain the appropriate defining fixes for Victor 93, and dialed all the new information back into the navigator. I found myself under high workload, dividing my time between the navigational challenges and keeping the Warrior on the correct heading. This generally meant making minor heading corrections between setting waypoints. If I felt tired on arrival at Williamsburg, I was really feeling it now. 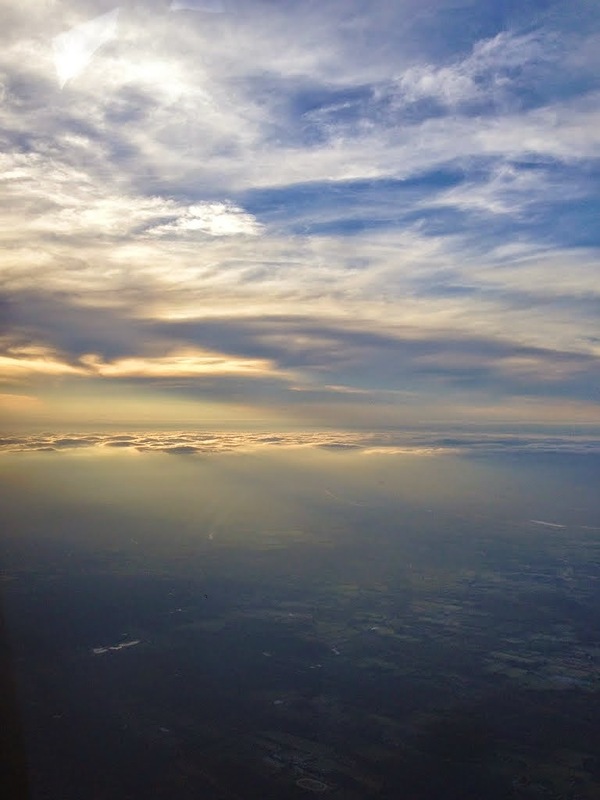 Once the system was reprogrammed and we reached cruise altitude, I relaxed slightly. Then we were transferred to Patuxent Approach who immediately noted yet another new route. "Ready to copy," I responded, working to keep the dismay out of my voice. After all, re-routes are common in congested airspace and no one was subjecting me to any unfair treatment. "Warrior 481 is cleared to Sierra Delta Charlie via direct LOUIE, T291 (my first T-route! ), Harrisburg, Victor three one, BEEPS, direct, maintain seven thousand." I was back to the drawing board with even more knob twisting. 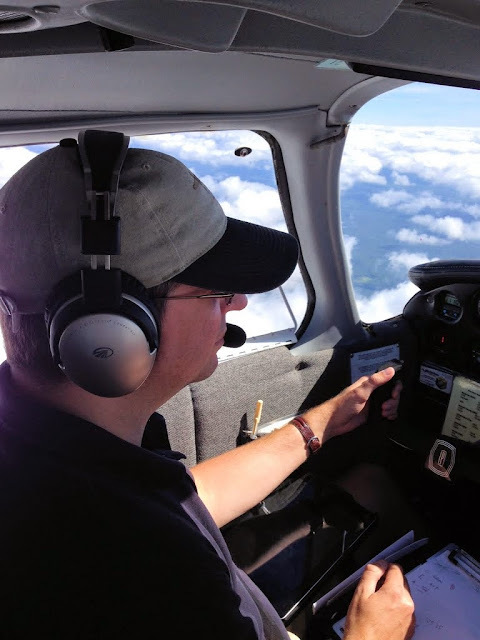 Once the navigator was reprogrammed again, I triple checked the clearance against the chart and the GPS. It would not do to misinterpret the clearance and have an unauthorized deviation within the most secure airspace in the United States. Or more accurately, near the most secure airspace; our final clearance kept us entirely outside the Washington DC SFRA. We encountered our first significant cloud build up while on with Patuxent Approach. I asked for a slight deviation to the right. "Can you go left or right?" responded the Patuxent controller whom I had mistakenly addressed as "Potomac Approach" at least twice because I was still a little task saturated. When I responded in the affirmative, Patuxent approach continued, "good, because there's a restricted area to the right." "Warrior 481 will deviate left." "Great idea!" cheered the Patuxent controller. In my defense, we were already in the middle of restricted airspace on our clearance to LOUIE. Over Baltimore, larger build ups presented themselves and I undertook a significant deviation around a cluster of them. Stratus reassuringly displayed those areas with intense rainfail and, though we were surrounded by clouds, we were generally in the clear. I deviated around those that I could and picked smaller ones showing little vertical development to punch through. There was some chop in these, but none of it significant. In the blind, the instruments would deviate a bit from their desired readings and I would lightly push, pull, and twist until those needles returned to where I wanted them to be. 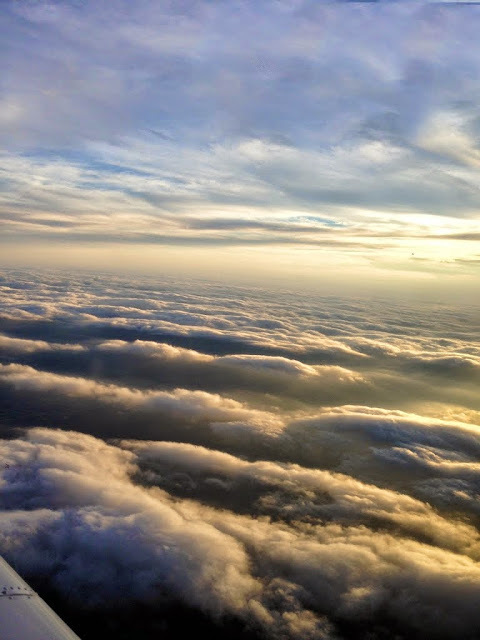 When we first entered the clouds, Kristy groaned. However, a faint sound of clapping originating from The Bear could be heard. In this way, they are so very different. Approaching the Harrisburg VOR, my eyes told me that there was a monstrous brute directly ahead. When flying a mile and a half above the countryside and a massive mountain of cumulonimbus seems to extend up to low Earth orbit, this is a clear sign of something to be avoided. Per Stratus, the leading edge of the beast was thirty miles away. It is important to understand with Stratus, however, that the data are already old when uplinked to the airplane and we were downwind of the thunderstorm cell. Distance data should be interpreted with margin for error. The Harrisburg VOR was five miles away, however, and upon reaching it, we would change course out of the path of the monster. The beast floated over the world, rearing up so as to blot out the sun. As we entered its shadow, Kristy was visibly nervous. To her eye, I was playing chicken with that cell. All of the available data suggested to me that it was still tens of miles away. We reached the Harrisburg VOR and turned northeast on Victor 31 toward Selinsgrove, moving out of the path of the cell. Stratus depicted two more cells directly in our path. I coordinated a plan with Harrisburg Approach who used their real-time radar to provide a vector around them to the east. After a few minutes on an assigned heading, we were cleared direct to the Hazleton VOR to give the weather an even larger margin of safety. Along the way, we passed through some light rain. "Warrior 481, say flight conditions," called Harrisburg. "In the clear, light rain, smooth ride," I responded. The controller seemed pleased to hear this in his acknowledgement. 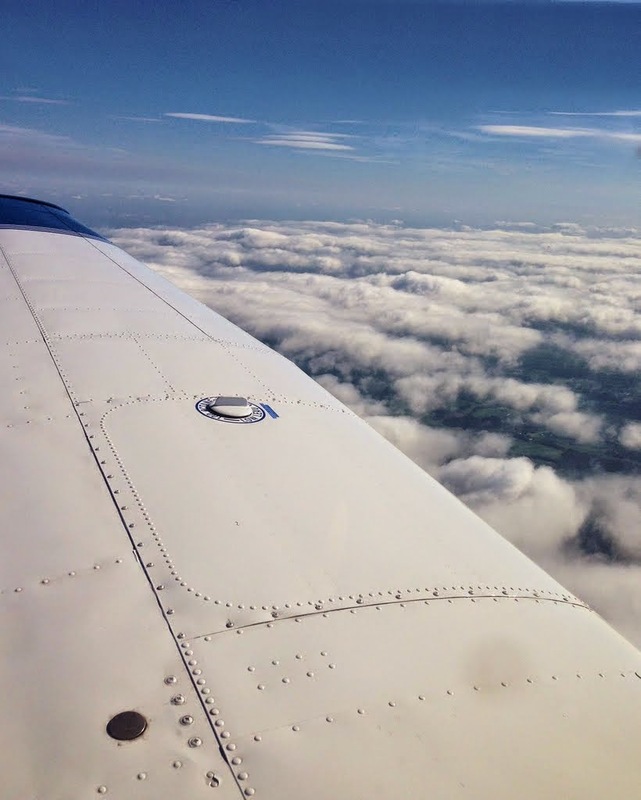 We passed smoothly through some clouds and, eventually, emerged into VFR conditions. Behind us, shadows from the storms over Selinsgrove cast the world into darkness. Before we reached the Hazleton VOR, Wilkes-Barre cleared us direct to Williamson-Sodus and handed us off to New York Center. I dialed the new frequency and nudged the flip flop to make it active. Center was talking to another aircraft, so I held my peace awaiting quiet air to check in. Before I could do so, Center broadcast, "Warrior 481, Binghamton altimeter is 30.03." Kristy and I exchanged surprised looks. It was the first time I had ever had a check-in acknowledged on frequency without ever actually checking in. His clairvoyance evidently did not extend to airliners, however. "Airliner ABC, were you planning to comply with your restriction?" he asked without obvious malice. It was something of a relief to leave Pennsylvania behind, as though the legislated state boundary could somehow contain the nasty weather rampaging through the Keystone State. 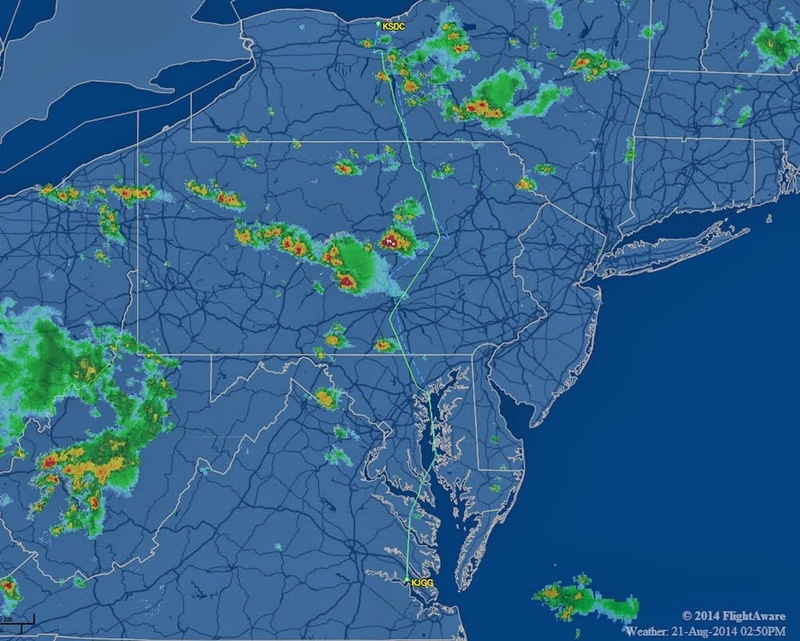 The Stratus radar picture for our route through New York looked more promising. Elmira Approach was happy to grant multiple diversions around towering cumulus. We passed one cloud dousing the landscape with rain. We stayed mostly in the clear, navigating smoothly through canyons defined by churning masses of turbulent vapor. In the distance, a three headed hydra worked to build itself into a titan. 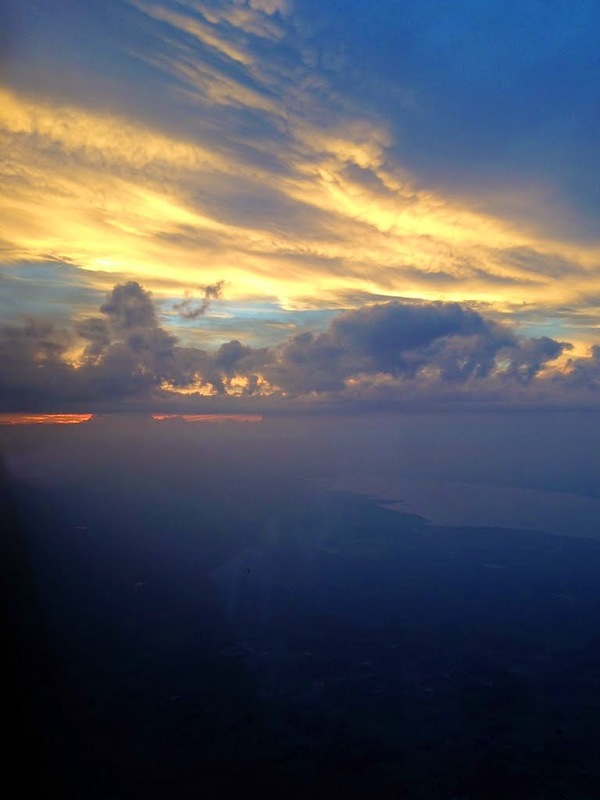 Over the Finger Lakes, we emerged from the maze of clouds as if from a tunnel. Realizing that I was tense, I pulled my feet off the rudder pedals and flexed my toes, creating a ripple of metatarsal tectonic activity that relieved some of the strain with a satisfying crackle. Flying past Seneca Lake, we saw the rainbows. It was Kristy's first time seeing rainbows from the air. 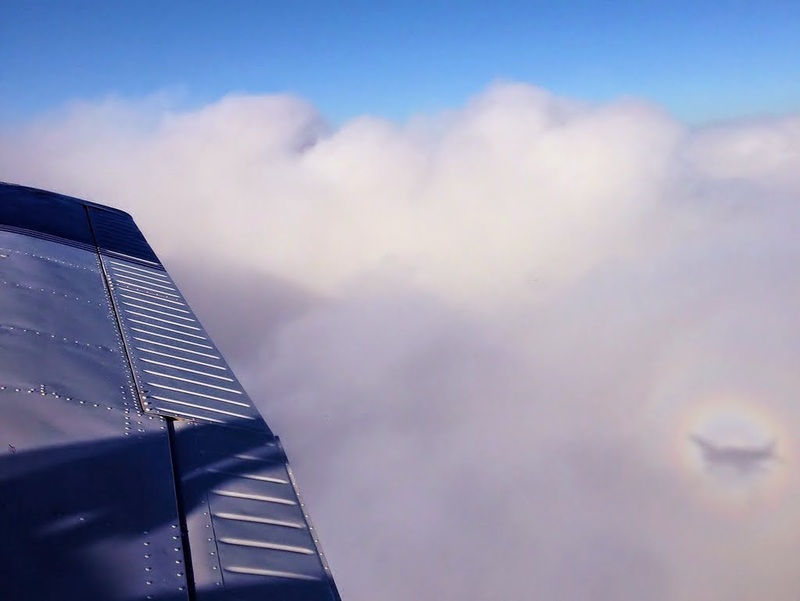 The last time I saw a rainbow while aloft was during my first solo flight in 2001. But we were soon to learn that we were far from home free. This is why I really do not believe in omens. Fifteen minutes from Sodus, Stratus showed the area to be clear and the airport's automated weather station was calling good VFR conditions. 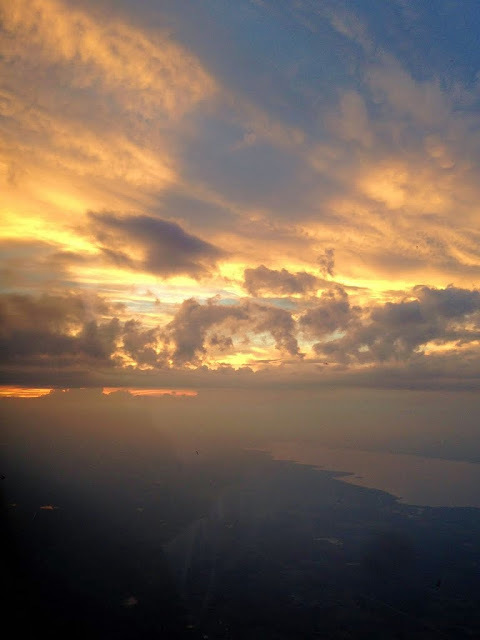 After a long slog of a flight from Virginia, we were almost home. 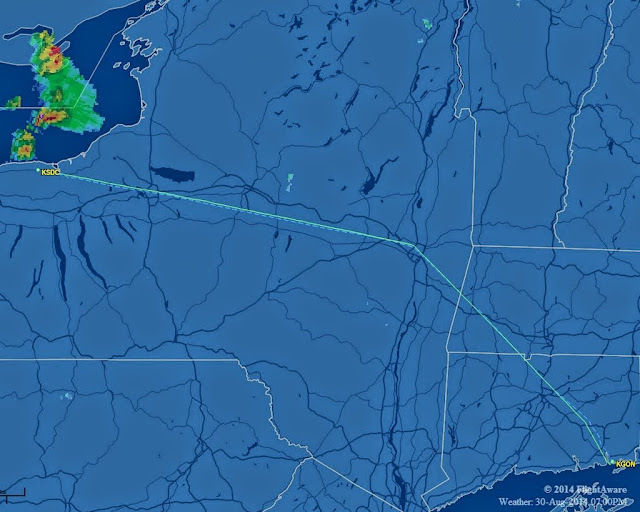 "Warrior 481, there's a large cell with extreme precipitation near Sodus that will impact your route of flight." This from Rochester approach. Ahead, there was a vague shadow in the distance, but the haze made it difficult to identify visually as a cell. Stratus showed no radar returns in the region. I acknowledged the information and took a moment to think. 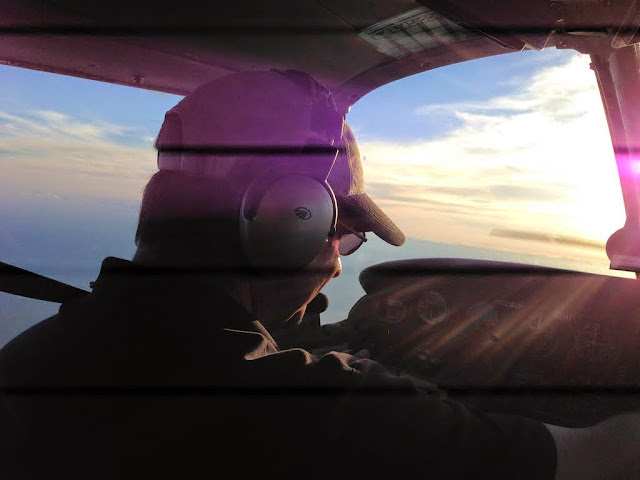 The sun, streaming into the cockpit over my left shoulder, added enough glare to the iPad screen that I almost did not see it: the time stamp of the last weather update was displayed in red and indicated that thirty minutes had passed since the displayed radar data were received. Thirty minutes!? The Stratus continued to communicate with the iPad and indicated that it was receiving information from three FAA ground towers. But the weather picture on my iPad was frighteningly out of date. I was left with no time to troubleshoot further. Wreathed in haze and shadow, I could not discern the weather that Rochester warned me about, its distance, or its relative position to home. Off our port wing, Canandaigua was in the clear. It was time to reassess from the ground. 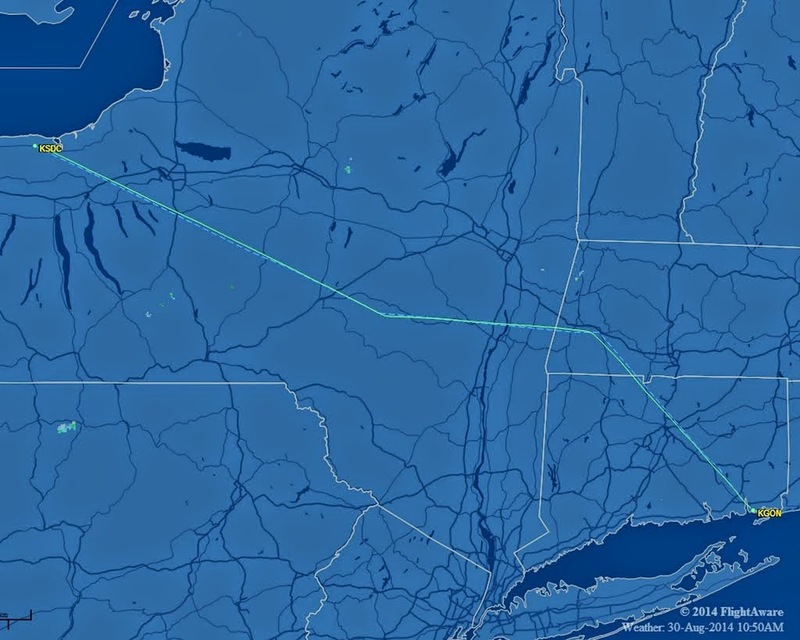 "Rochester Approach, Warrior 481 would like to deviate to Canandaigua." "Warrior 481, that's approved. Can you verify that this is a deviation for weather?" "Affirmative, 481." We turned left, away from the shadow. 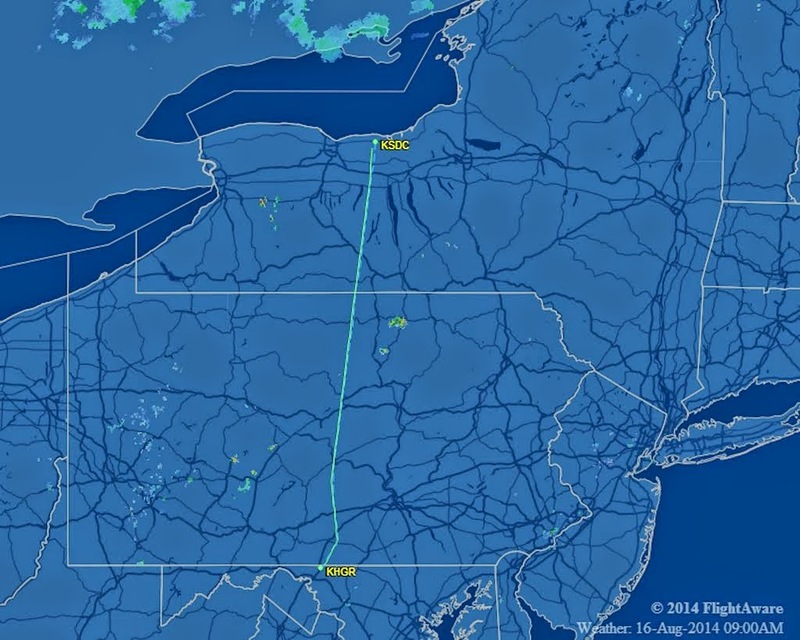 The last time I landed at Canandaigua was when I diverted there because of weather over Le Roy four years ago. Evidently, the place is a good port in a storm. In the pattern, Kristy wondered aloud how long it would take The Bear to realize that something was amiss. As it turns out, not long. Clearing the runway, Kristy switched The Bear off of isolate in time for us to hear, "hey! This isn't our airport!" She is an astute Bear. On the bright side, she got to add a new airport to her map as was the case for every field we visited on this trip (she is up to 64). We spent forty minutes on the ground as an intense, isolated cell audibly rumbled between our location and Sodus. While there, we met Brian who works at the airport and owns a Cherokee 180. It was just repainted on-site and he brought me into the hangar to show off his pride and joy. To my eye, the paint shop did good work. Brian offered us cold water and enlisted The Bear's help in some simple arithmetic, a challenge she met proudly. I also met a student pilot from the Buffalo area who was wearing a Duncan Aviation shirt. When I asked him about it, I learned that he had family ties back to Kalamazoo, which was the origin of the shirt. We made the brief hop home sans iPad, Stratus, or the watchful eye of Rochester Approach. The cell that caused our diversion had lumbered east, having developed into a classic anvil shape (above). We skirted the bit of clag left in its wake to land at home after 7.0 hours of flying. 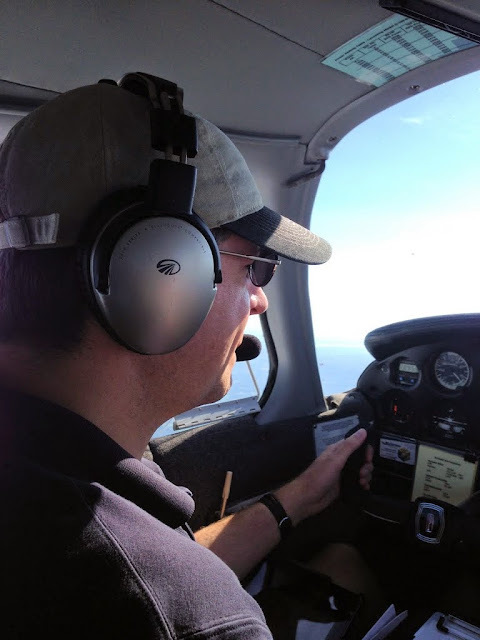 I have been flying for twelve years as a certificated pilot and, in that time, have made some long flights. But I have never been more exhausted after a flight than I was after this one. Maybe I was poorly rested from the start. Maybe the unfamiliar weather environment, both spectacular and foreboding, was particularly draining. Maybe it was a combination of all those things plus the presence of my family on board. Regardless of the reason, I was absolutely bone-tired. 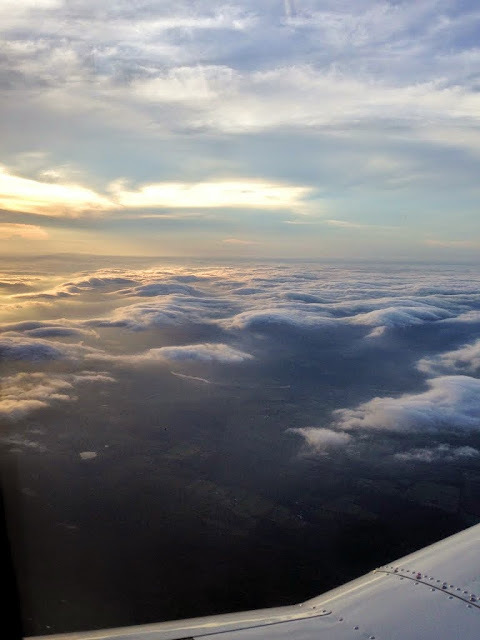 Despite that, I felt that the flight went well, that I made good use of the resources available to me (particularly ATC and ForeFlight/Stratus), and that my decision making was sound. Stratus seemed particularly useful in prompting questions to ATC about the weather in order to get their real-time assessment. I found myself using Stratus strategically, but leveraging ATC and my own eyes for developing tactics. I also came to appreciate that an autopilot might be a really good idea someday. There was no evidence of Robert DeNiro clinging to the belly of the airplane since our departure from Cape Fear Regional Jetport.